Rosacea is a common chronic skin disease, characterized by a redness that spreads across the nose, cheeks, forehead, and chin. In some cases, rosacea may also appear on the neck, chest, scalp, or ears. 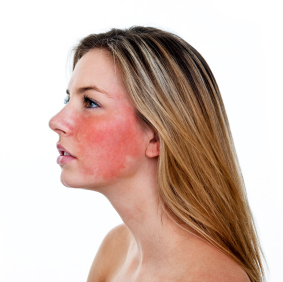 Although the exact cause is unknown those who develop rosacea can usually trace the disease to another family member. Aside from genetic susceptibility, there are environmental factors that can contribute to the development of rosacea and broken facial capillaries that may appear. Environmental factors that can trigger or aggravate rosacea increase blood flow to the surface of the skin, which spreads and enhances the reddening to other areas on or around the face. Some of the most common factors include sun exposure, hot foods or beverages, spicy foods, alcohol, extreme weather conditions, such as cold, hot, or windy environments, stress, anger, or embarrassment, strenuous exercise, hot baths or saunas, and certain medications that dilate blood vessels. Rosacea typically appears after the age of 30 as general redness If left untreated, rosacea may gradually worsen and develop new symptoms. There are four different types of rosacea based on the patterns that develop, many of which can come and go in cycles of flare-ups and remissions, making it important to seek help even if symptoms have subsided. Erythematotelangiectatic Rosacea (Subtype 1): A mild case of redness, flushing, and visible blood vessels may occur across the faces. As the disease progresses beyond redness or occasional blushing, the skin may burn, sting, itch, or feel tight. Papulopustular Rosacea (Subtype 2): Redness, swelling, and acne breakouts, along with persistent pimples, typically spread across the face. Acne can become so severe, raised red patches called plaques may develop along the skin. Phymatous Rosacea (Subtype 3): Redness tends to become bumpy, persistent, and blood vessels and pimples may appear. In severe cases, the skin thickens and the nose may grow swollen and bumpy from excess tissue — a condition called rhinophyma. Ocular Rosacea (Subtype 4): In certain cases, a person suffering from rosacea may have irritated eyes that appear watery or bloodshot. Their eyelids may become red and swollen, and in severe conditions, it can lead to corneal damage or vision loss without medical intervention. The disease can affect anyone, but women and individuals with fair skin who tend to flush or blush easily are considered to be at greater risk. However, severe symptoms are more commonly seen in men because they tend to delay seeking a dermatologist for help, which allows the disease to advance and worsen. What’s the Best Way to Treat Rosacea? Lasers are the most effective treatment of redness and facial blood vessels. The most effective laser for the treatment of rosacea and facial capillaries is the pulse dye laser. The V-Beam laser is the most advanced pulse dye laser available. Usually, multiple treatments are necessary for the improvement of broken capillaries on the face. This laser is safe and can be used without numbing cream as it is equipped with a cooling spray. Broken capillaries can be improved and eradicated anywhere on the face including cheeks, nose, and the chin. The V-Beam last emits precise waves of energy into targeted sections of the skin. The laser’s energy heat is selectively absorbed by the broken capillaries, which causes the blood vessels to clog and become naturally absorbed by the body, ultimately resulting in eradication. Dr. Rokhsar has been a national speaker and teacher on the use of V-Beam laser for both facial blood vessels and redness and has trained many physicians on its use at various medical meetings and workshops. If you’re looking for laser treatment of rosacea in New York or Long Island, contact us right away!